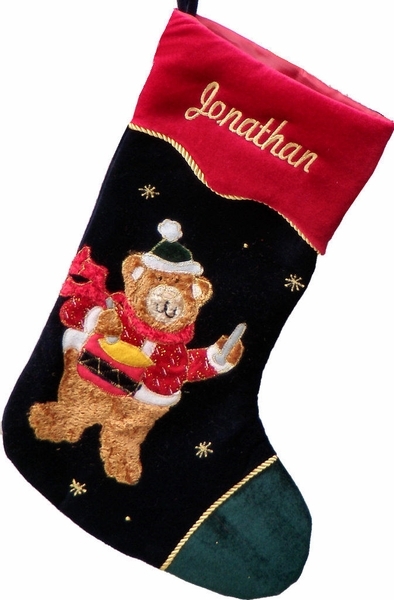 Very cool large velvet designer Christmas stocking personalized on the with metallic gold embroidery thread. This is an extra large stocking for those who like to have a heirloom stocking that can fit lots and lots of gifts. Nice workmanship will make this stocking a treasured decoration and will surely please the recipient. Measured along the diagonal from the top left hand corner to the toe, the stocking measures 21 inches, and the width along the cuff is 8.5 inches. Materials Velvets and other true to life materials, such as real plush on the teddy bears body and real wool scarf knit is what makes this stocking a true keepsake treasure. Decorated with metallic applique embroidery. Lining: This stocking is fully lined inside with polyester satin for the luxury look and feel. Names can be personalized on the cuff of this Christmas stocking with GOLD metallic embroidery thread to compliment the appliqué design.